Are You Tired of Red and Green Yet? The holidays might benefit from a color update. How about yellow? The worldwide pandemic of loneliness that afflicts so many freelancers and writers has a cure. Take this test. At this magical time of the year, it’s what we least expect that delights us the most. Our annual season of bounty is ripe with photo opps and apps to capture the sparkle. New Orleans turned on its Christmas light show, and I turned on my iPhone. So did others. A Shoe Shine in New Orleans, Two Bits? You can find a seasoned shoe shine man in Jackson Square to shine your shoes and tell some tales. Where can you find the most fun, and the most powdered sugar, in the entire Big Easy? Such an eloquent reminder of lives lost in lively Jackson Square: All lives matter. There’s more than mere fun and festivities involved when you shop local. Austin’s Blue Genie Art Bazaar might just be your last stop for holiday shopping. What does it mean to a photographer when all of the stars align? 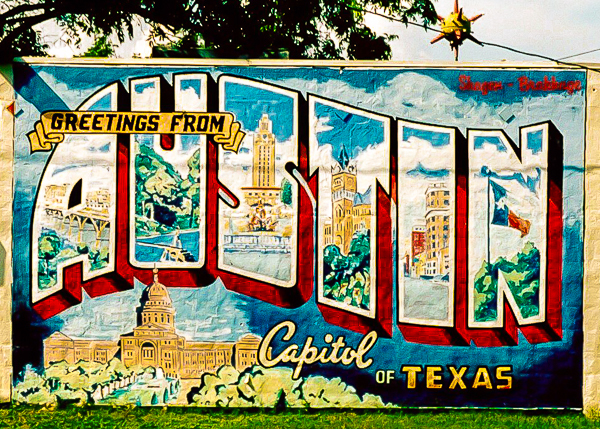 Which Austin, Texas landmark has this fantastic neon symbol of its name? When you let it, your iPhone will push you to use your imagination to see what your eyes cannot. A little-known fact about Austin, Texas, is that Shakespeare spent his formative years here. Pairings are quite common in life: wine and cheese, football and beer, man and woman. Some pairings are less obvious. Pairings is a blog about pairing art with everything else at AustinDetails.me, where art meets tech with pictures and words.